Fennel seeds are a common sight in the Indian kitchen. Their aroma is breathtaking. 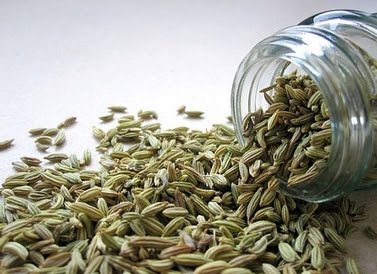 Though both aniseed and fennel are called saunf in ‘Hindi’, fennel is somewhat larger than aniseed. Commonly used for seasoning and garnishing in Indian cuisines, this seed has other uses as well. * Chewing a spoonful of fennel sees or saunf after meals will prevent bad breath, hence very effective as a breath freshener. * A decoction of fennel and water helps in relieving colic in babies. * It also aids in regulating menstrual irregularities. * A tea made with a few fresh sprigs of fennel or a teaspoon of seeds will relieve indigestion; also useful for flatulence and constipation. * It treats respiratory congestion effectively, hence a common ingredient in cough remedies. * A tea made from fennel helps to stimulate the flow of breast milk. * An infusion makes a soothing eyewash. * The oil from the seeds is also used in perfumery and for scenting soaps. * Powdered fennel has the effect of driving away fleas from kennels and stables. * A decoction of the leaves and root is good for serpent bites and also to neutralize vegetable poison such as in mushrooms, etc. Thanks for the really good information on this wonderful spice! Fennel for regulating menstrual irregularities? Now that's new. Thanks for sharing. Hi Anonymous, you can also check this post for menstrual irregularities. Fennel Seeds (Sauf) are very effective for digestive problems. These seeds can be chewed upon or had as a tea concoction for beneficial effects upon the stomach. In India, these are routinely chewed upon after meals to aid in digestion after a rich meal while acting as a herbal mouth freshener. Its antispasmodic properties which relax smooth muscles in the digestive tract also help with uterine contractions. In high doses it has been used to promote menstruation. This mild estrogenic quality must have been the reason for its traditional use in promoting the production of milk in nursing mothers. In older women it can be used to naturally alleviate some of the discomforts of menopause. Pregnant or nursing mothers should not take fennel. Neither give it to small children, or take it for extended time yourself. A few cases of asthmatic and allergic reactions have been reported as well. Fennel seeds contain good amount of calories, protein, fat, vitamin A, calcium, iron, potassium, vitamin C, niacin, phosphorous and sodium. Fennel essential oil is used for its soothing, cleansing and toning effects on the skin, while at the same time improving circulation and fighting water retention and puffiness. fennel seeds can be chewed by themselves, made into tea or used in cooking. a cup of tea (1 tsp seeds to 1pot of water) will calm the stomach and aid in digestion, as well break up any gas bubbles. like boiled cabage, a couple seed added to the boiling water adds flavor and reduces gas. Fennel oil is one of the most effective aromatherapy oils for reducing bloating. Blend 2 drops of the oil in 1 ounce of sweet-almond oil. Gently rub your abdomen with the oil to ease swelling and gas.